Temporal predictions are increasingly recognized as fundamental instruments for optimizing performance, allowing humans to exploit regularities in the world. It is proposed that the motor system instantiates predictive timing mechanisms, helping to synchronize temporal fluctuations of attention with the timing of events in a task-relevant stream, thus facilitating sensory selection. I will present a neurophysiological account for this theory in a paradigm where participants track a slow reference beat while extracting auditory target tones delivered on-beat and interleaved with distractors. At the behavioral level I will show that overt rhythmic movements sharpen the temporal selection of auditory stimuli -by facilitating the perception of relevant stimuli, while actively suppressing the interference from irrelevant stimuli-, thereby improving performance. Capitalizing on magnetoencephalography recordings I will provide evidence that temporal predictions are reflected in Beta-band (~20Hz) energy fluctuations in the sensorimotor cortex. While auditory processing in both auditory and right frontal regions is modulated by temporal predictions, only energy fluctuations in the right frontal cortex predict behavioral outcome. Together, these findings are compatible with Active Sensing theories, which emphasize the prominent role of motor activity in sensory processing. 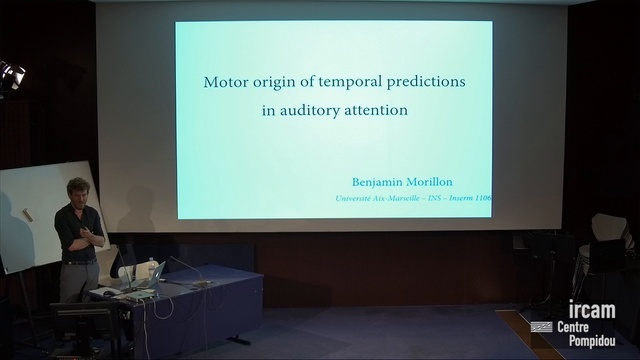 Finally, I will dissociate the notion of temporal predictions from the idea of entrainment to periodic sensory inputs, and show in two behavioral experiments that periodic stimulation specifically fastens motor responses, whereas temporal predictions improve the precision of auditory processing.